You may be looking for the gargoyle characters. Winged Heartless that mostly appears in Halloween Town. They can move from one place to another almost without notice. Since they are prone to sneak attack, they often get caught off guard by counter attacks. A winged Heartless that mainly appears in Halloween Town. It pelts its stunned opponents with fireballs. Become invisible and reduce your chances of being hit. 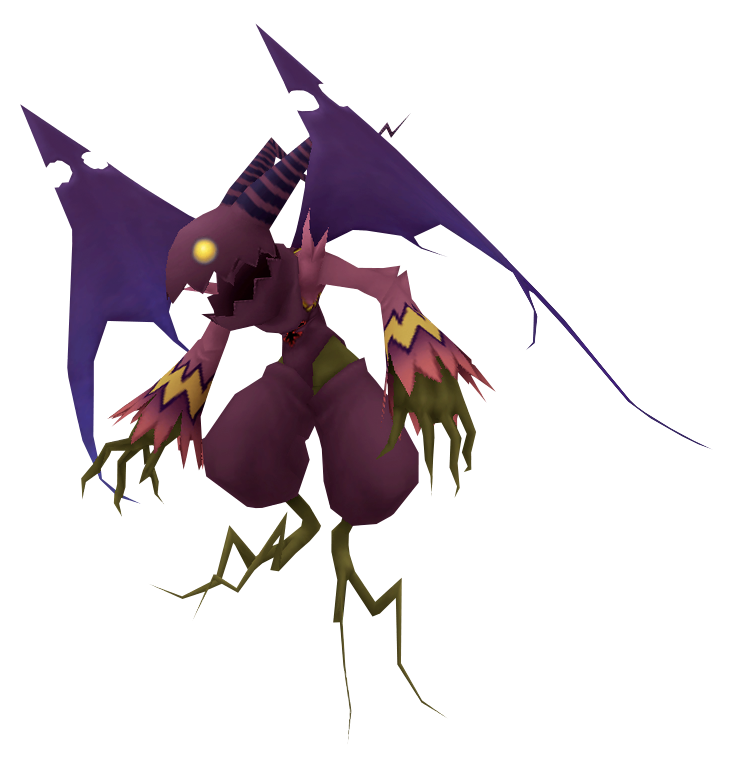 The Gargoyle is an Emblem Heartless found in Kingdom Hearts, Kingdom Hearts Chain of Memories, and Kingdom Hearts χ.
Heartless Gargoyles have dark grey skin is covered by a dark purple bodysuit with roughly stitched-on light purple sleeves that end in a gold zig-zag trim and jagged edges. The purple color extends to cover the head and horns, and the horns also feature black stripes. Like other Heartless, the Gargoyle has golden eyes and a craggy maw, but it can unhinge its jaw to fearsome proportions. Their talons are long, but not nearly as alien as their dark grey feet, which are spindly and two-toed. Their leather-like wings are also pointy and sharp, particularly the tops which resemble spires, spearheads, or even a portion of the Nobody symbol. The Kingdom Hearts Final Mix Gargoyles are much more colorful than the darker version seen in the original game. 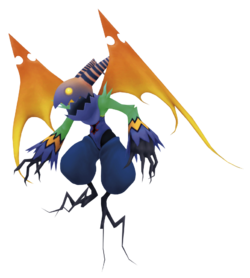 The Kingdom Hearts Final Mix versions are clad in light blue, with bright green sleeves, the blue gradating to a pale pink on the top of the heads and horns, and flame-like orange and yellow wings, while their feet are black. The Gargoyle gets its name from resembling architectural gargoyles, stone representations of a mythological spirit said to ward off darkness. During the climax of Sora's adventures in Halloween Town, Oogie Boogie calls out to the Heartless after swallowing the artificial heart created by Dr. Finkelstein, hoping to control them. The only Heartless that came to help him were two Gargoyles. This type of Heartless has a hard-to-read attack cycle. One moment it is in orb form, flying around Sora's head, the next moment charging up an attack by spewing a homing ball of light from its mouth. 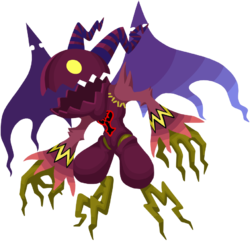 This Heartless actually only has a few basic attacks, but they are quite powerful, so watch out. Wing Attack: Enlarges its wings and thrusts them at Sora with alarming speed, dealing great damage. Claw Attack: Lashes out with claws, dealing a heavy blow. Kick Attack: Takes a quick swing with both its legs, dealing small damage. Spewing Attack: Throwing back its head, it sends out a heat-seeking ball of powerful energy, causing heavy damage. Transporting: Not so much of an attack, but more of away for it to get closer to Sora. It turns into a ball of blue flame, and dives down towards Sora, preparing for an attack. Be on guard if one is doing this. In Kingdom Hearts, if timed correctly, Sora can earn Tech Points for blocking the Gargoyle's attacks. On the box art of Kingdom Hearts, a Gargoyle Heartless is in the bottom right corner. ↑ Before Kairi's rescue, 6 Tech Points can be earned for deflecting the Spewing Attack in Kingdom Hearts. ↑ After Kairi's rescue, 36 Tech Points can be earned for deflecting the Spewing Attack in Kingdom Hearts. ↑ After Kairi's rescue, 12 Tech Points can be earned for deflecting the Wing Attack in Kingdom Hearts. This page was last edited on 6 September 2018, at 21:48.